Daughter of Ana and Jakob Kostakowsky, she was born in Leipzig, Germany, in 1913 and spent her childhood in Berlin. She arrived in Mexico at the age of twelve. After meeting Diego Rivera, Frida Kahlo and Rufino Tamayo, she decided to study at the Escuela Nacional de Artes Plasticas along with Carlos Mérida. In 1935 she married José Chávez Morado, and together they fought for social equality. They lived in the state of Guanajuato for many years, producing small works in gouache and oils. Upon returning to Mexico City she took part in founding the Galería Espiral. 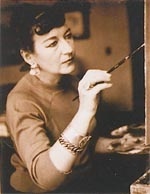 In 1945 she held her first individual exhibition in the Galería de Arte Mexicano and in 1946 traveled to Japan, fascinated by Oriental art, whose technique and style she incorporated into her painting. Olga Costa died in the city of Guanajuato in 1993.